Stefan Voitenko was born on 26 July 1909. He joined the Red Army in 1931. Leitenant Voitenko took part in the Soviet-Finnish Winter War in 1939-1940 where he flew Polikarpov I-153s in 13 IAP-KBF of the Baltic Sea Fleet. He totally claimed one biplane victory during the Winter War. This was claim during 95 missions and 10 air combats. When Germany invade the Soviet Union on 22 June 1941, Starshii Leitenant Voitenko served as deputy eskadrilia commander in 2./8 IAP-ChF of the Black Sea Fleet, flying Polikarpov I-153s. He was wounded while flying a reconnaissance mission on 30 October 1941 and was sent to Sevastopol for treatment. He didn’t return to 8 IAP-ChF after this. Voitenko was posted to 62 IAP-ChF in July 1942, flying LaGG-3s and Yak-1 with this unit. On 10 August 1942, Voitenko and Boris Maslov claimed a shared Bf 110 east of Novorossiysk Bay. Voitenko then claimed an Bf 109 in the Novorossiysk area before he and Maslov claimed a shared Ju 88 over Abrau-Dyurso. Voitenko left 62 IAP-ChF during 1943 when he was posted to 6 GIAP-ChF. This was the old 8 IAP-ChF, which had become a guard’s unit on 3 April 1942. With this unit he flew Yak-1 and Yak-9s. On 10 February 1944, the Yak-9s from 6 GIAP-ChF was in combat. First Boris Akulov claimed a Bf 109 before he and Voitenko claimed a Ju 87 each. On 5 November 1944, he was decorated with the Gold Star of the Hero of the Soviet Union (# 3800) and the Order of Lenin. At the time he had flown 241 missions and taken part in 45 air combats. On 30 December 1944, he took command of 43 IAP-KBF of the Baltic Fleet. This unit was at the time equipped with Bell P-39 Airacobras. On 19 July 1945, the unit was redeployed to the Pacific Fleet and at the same time the re-equipped with P-63 Kingcobras. With this unit, he took part in the Soviet-Japanese War between 9 August and 3 September 1945. Voitenko ended the war with 5 biplane victories and a total of 11. During his career he was decorated with the Order of Lenin (1 May 1940 and 5 November 1944), the Order of the Red Banner (6 March 1942, 5 November 1942), the Order of Patriotic War, 1st Class (15 April 1944 and 11 March 1985) and the Order of the Red Star (3 November 1944 and one more time at unknown date). He continued to serve after the war. 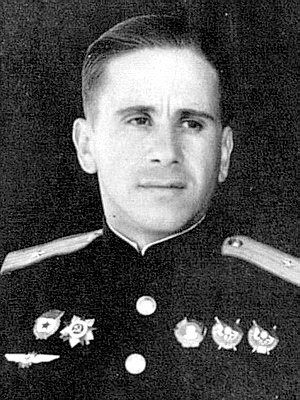 Voitenko passed away on 21 April 1992. TOTAL: 11 and 2 shared destroyed.